Military Intervention is never the answer. I dithered over posting this (on facebook) as I will probably lose “friends” over it…but enough is enough. Assad stands against the US NATO and the whole Axis of Interventionism Assad has steadfastly resisted Zionism and supported the Palestinian cause, one of the few Arab nations to remain loyal despite not always being appreciated for this stance. I speak regularly to people on the ground in Syria and those who have visited particularly to observe the June elections and I get a very different picture of Assad to the one portrayed mercilessly in the Western media. 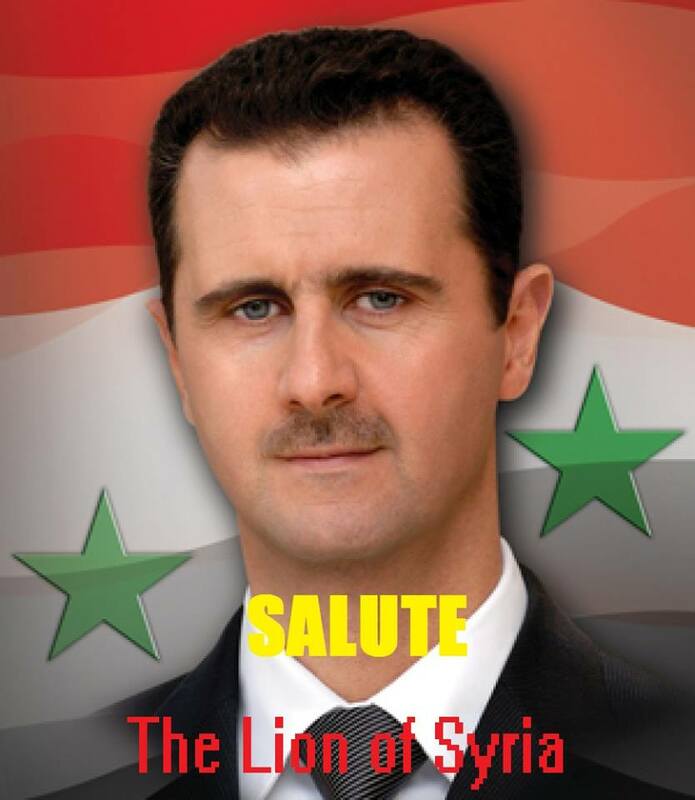 I will never sanctify any world leader but for me, Assad is the legitimately elected leader of his Syrian people, he has the support of the Syrian Arab Army and the majority of his people. As such the governance of Syria is his domain and has sweet FA to do with the US, NATO or any other bugger who thinks they can do better. Our governments pay no attention to our own homeless, impoverished, destitute, marginalized and racially or sexually segregated societies..what gives them the right to dictate to a sovereign nation when they couldn’t govern their way out of a paper bag. There are diplomatic solutions to any international issues and without US interventionism I am convinced they would have been found by now with Diplomatic/economic not military pressure. The US and her cronies are responsible for the exacerbation of “terror” in the Middle East either through direct funding, training and arming of these insurgents or simply through their imperialist agenda that breeds resentment on the ground they plunder and pillage. “Playing both ends against the middle, Obama wants to fight ISIS in Syria without emboldening President Bashar Assad, who is also fighting ISIS. And Obama reserves the right to bomb in Syria, a sovereign country, in defiance of Assad. Obama is playing with fire. The UN supports this intervention provided the US NATO airstrikes are “proportionate”. Well we have all seen how proportionate airstrikes are allowed to be by the UN, in Gaza. I for one, don’t wish this upon the people of Syria. Remember Shimon Peres in 2012 being interviewed and saying Assad must go? Ask yourselves why. I have also met people from Syria who have grievances against Assad…but if we accepted military intervention based on our own Governments crimes we would be courting disaster. Our own Governments without exception have been responsible either directly or indirectly for torture and crimes against Humanity. It is our responsibility to resolve those issues internally without the need for foreign military intervention. From what I understand Assad has shown a willingness for dialogue, this should be capitalised upon to ensure that any crimes that were or are being committed are resolved in a manner that ensures the country can recover & move forward from a war that is now being inflicted upon it by the US imperialist agenda in the region. It is utter hypocrisy to sanction action against Assad and yet fail time and time again to take action against the flagrant despotism & brutality of the Israeli Apartheid regime. The election turn out both in Syria and by Syrian nationals across the world speaks volumes. The people of Syria have made their choice to support Assad against the US NATO etc backed insurgents who are overrunning their country and massacring civilians. They have made their choice to support the one Government strong enough to withstand the US led invasion and destruction of their country. What happens after they rout the US “forces” is a matter for them to decide, not for our Governments to interfere in. Note below from my dear friend Eva Bartlett who has visited Syria and seen first hand the situation on the ground. These are the voices i listen to rather than the biased, Zionist owned and governed media. In the same letter, Father Frans insisted that what was occurring in Syria could not be described as a “popular uprising,” since the majority of Syrians do not support the opposition and “certainly not” its armed component. Back at my hosts’ rented home in a different area of Homs, they show me photos and videos of their own ravaged home, footage which Abu Abdu took himself. He meticulously points out how not only did the “revolutionaries” occupying their home utterly trash and destroy it, but they thieved every conceivable thing from it. “Here, they took the motor to the washing machine. Here, they stripped the fridge of its motor. Here, they took the taps in the kitchen. They stripped the electrical wiring.” Basically, they took anything that could be ripped out of wall or floor that could in any way be sold: metals, piping, wiring…and of course all of the family’s jewelry and valuables. September 17, 2014 in Sryia.